The architecture in Bhutan is most distinctively visible in its ordinary dwelling houses to the most impressive public structures such as Dzongs (fortresses). All architectural structures are strictly based on the unique architectural designs of Bhutan, thereby preserving them in their finest forms. The massive Dzongs, the ancient monasteries and the humble farm houses stand out as an important part of the country`s landscape. The contemplation and visualization of colors and patterns in art and crafts are considered an integral part of worship and spiritual practice. Thus all forms celebrate color and pattern in its most vivid and expensive form. Bhutanese textiles are renowned for their distinctive patterns, inspired by nature and hence prized among collectors as a rare art form. Because of its importance, weaving also receives Royal patronage and in order to help the tradition alive, competitions are also held and prizes awarded. A textile museum has been established to generate interest and display the rich collection of most intricate fabrics woven over different periods. Bhutan`s art and crafts are the identity of this Himalayan kingdom. 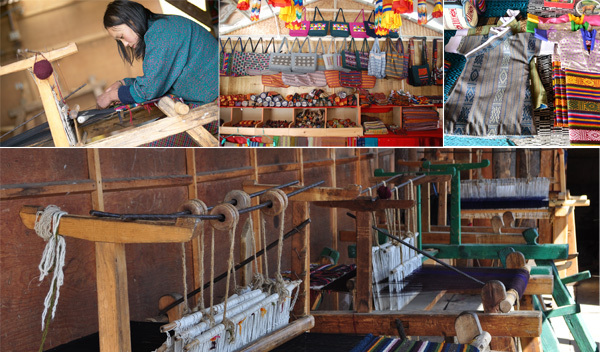 The art of Zorig Chusum or the 13 art and craft of Bhutan remains very much alive today. These are two institutes of Zorig Chusum where these traditional art and crafts are being taught today- one in the capital, Thimphu, and other in Trashiyangtse in eastern Bhutan. There are also many handicraft shops and emporiums in town displaying hand woven textiles and other hand crafted artifacts, art works, crafts and souvenirs.